The Street Division is made up of six (6) employees who are responsible for repairing potholes, leveling street depressions, patching deteriorated areas of streets, repairing utility cuts that have been made by Water and Sewer crews to repair City utilities, and repairing defected areas in pavement. This division is also responsible for removing large debris that has fallen into the street, such as items that have fallen from vehicles and those that are illegally placed. The Street Division’s goal is to repair a pothole within five (5) business days, weather permitting, once the pothole is reported. The Street Division is also responsible for drainage maintenance. This includes repairing catch basins, storm drain inlets, storm drain pipes, and removing debris from drainage channels and storm drains to promote proper drainage flow. The Street Division is also responsible for trimming and removing dead trees from the City’s right-of-ways, and also removing trees that have fallen into drainage channels. The Street Division also has some traffic maintenance responsibilities to ensure safe and efficient use of public streets. In-house crews are responsible for repairing and replacing damaged regulatory signs (i.e. stop signs) and street name signs. The City of Brandon is also responsible for providing maintenance of all traffic signals to promote proper flow of vehicular traffic and reduce traffic delays. 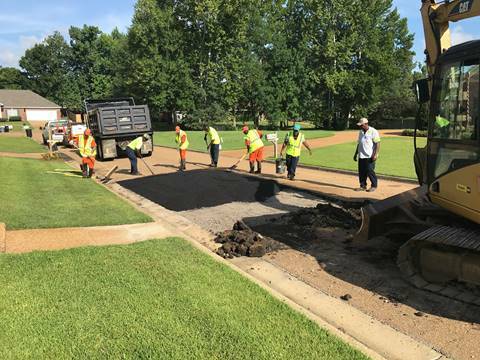 The City is also responsible for performing street striping activities to convey guidance and regulation to traveling motorists on City of Brandon streets. The City solicits the services of contractors to perform these tasks, as needed. Please contact the Public Works Department for any traffic signal issues or pavement marking requests and we will coordinate response efforts with the contractor.